The 2013 Ford Flex first made its public appearance at the 2011 Los Angeles Auto Show. When Ford showcased this vehicle last year it came as a surprise to many that Ford has kept this crossover running and even turned it into a 2013 model since it already had the Ford Explorer SUV for this particular market segment. 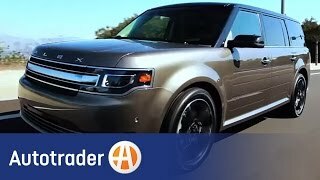 Nevertheless, the 2013 Ford Flex is quite a good car and it should keep its buyers happy with the various features and performance attributes it comes with. The 2013 Flex is powered by a standard 3.5 liter V6 engine, which is now capable of giving out 285 HP, 20 HP more than what the earlier Flex had. The engine generates a maximum torque of 253lb-ft @7000 rpm. With projected fuel economy of 18mpg in city and 25mpg on the highways, the 2013 is also more fuel efficient than its older cousin. 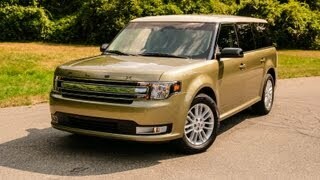 The 2013 Ford Flex will also have the option of a turbocharged EcoBoost engine with an equal displacement. But this will give out 355 HP. Both these engine will be connected to a six-speed automatic transmission. Safety features of the 2013 Ford Flex include Ford’s latest Blind Spot Information System (BSIS), push button start, Adaptive Cruise Control System along with rear inflatable seatbelts, active parking assistance and rain sensing wipers. 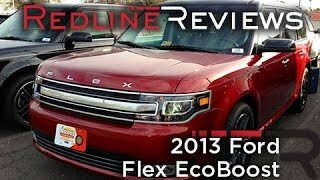 As far as look of the 2013 Flex is concerned, it possesses a new front with redesigned headlights and a new grille. The car has a much more rounded fascia which gives it somewhat of a soft look. The grille of the 2013 Flex now has the word FLEX on it instead of the traditional blue Ford symbol. On the inside, the car gets new instrument clusters, redesigned steering wheel and new seat trims. The infotainment and connectivity in the new Flex gets a boost with the installation of the MyFord Touch system. 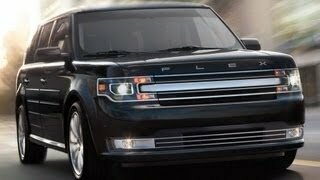 The 2013 Ford Flex is slated to have a base price of around $33,000.